Hello ladies~!! (≧∇≦)/ I'm going to share my opinion about this Velvet Emulsion by Clarins. I got this from Clarins event on this post and have been using it everyday, day and night without skip/mix it with other emulsion. I was planning to make the review after use it for 1 month and now it's almost 1 month XD so I'm going to make the review of it. hehehe (All my opinion is based on my personal experience and I'm not being paid or threatened LMAO XDD ). Ingredients : Sea Lily Extract, Raspberry Extract, Alchemilla Extract and Parsley extract. ღ Texture : Light emulsion and absorb quickly into skin. Makes my skin feel really smooth! How to use : Warm the emulsion in palm of your hands then tap it all over your face and neck. - At that time, my skin condition is normal. No acne, redness, just a bit dry over my cheek and not smooth. The 1st time use, I fell in love with the scent and sensation on my face. I apply it with tap all over my face and warm it with my palms. My skin feel really supple and elastic. I didn't see any brightening effect on the 1st week, but my skin become smoother after use this emulsion. - My body started not feeling well because lack of sleep and busy, it has a big effect on my skin. My skin becomes dull, tired and small pimples appear around my eyebrow and nose. My pores becomes more visible and I even didn't want to see my skin with my 3x zoom-Mirror because it made me stress. LOL, BUT, I still use this emulsion day and night, still believe this emulsion can heal it, at least repair my skin texture. This week the effect I feel was my skin look more brighter in the morning, not oily but my pimples still there. My skin texture look more better, just a little bit. My skin texture look better on the 4th day of the second week. - I was still sick but feel a little better, my pimples was dissapear too. But, leave scars which I HATE so much! -_- , please don't leave any more scars on my face~! I already has many because of my dna, I have few spots around nose and can't be healed. I don't even believe in any spot corrector/spot eraser, something like that. This emulsion NEVER claimed to brightening the spots or whatever it is, so I didn't hope anything from it. At this stage, my skin texture is more better than last week and my skin is feel soft and supple again. I think it because I use this emulsion routine and drink lots of water. - Unconsciously, I love to touch my skin, especially my cheek now. Because it's really smooth and supple, lol. The scar is still there, but not really dark anymore like before. My skin texture is look more evenly and when do make up, my face look smoother, not looking greasy. Sometimes, if I wear make up for more than 6 hours, my face started to look greasy -_- euh. This emulsion claimed to improve make up, so I think that is one of the effect. ✩ It does make my skin feel more smoother, soft like velvet. Seriously, I feel like touching it all day XD , but that's not allowed because touching skin sometimes bring bacteria to skin. 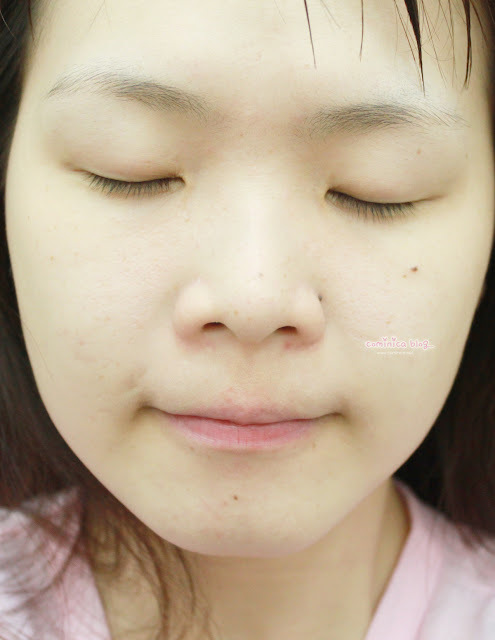 ✩ My skin texture look more evenly, more healthy and softer. ✩ This emulsion doesn't make my skin breakout and that's a PLUS for me, because it means the ingredients is natural and safe, my skin is really sensitive. ✩ My skin type is combination, my T-zone can't stay rich cream/rich emulsion because a pimple will appear. But, since this emulsion is light, I'm so happy with the texture and formula because it doesn't make my T-zone feel oily (not at all), but being in AC room all the time makes my cheek and jaw a bit dry. So far, I LOVE this emulsion so much!! It does what it claimed. If you're planning to get this emulsion please don't expect a miracle emulsion which can make your skin look more fair and fair, erase all your spots/scars because there's NO miracle that can ERASE it except you do a plastic surgery or maybe a laser. For me, a moisturizer which can make my skin look healthy and doesn't make my skin breakout is enough. Because, I love my skin even though there's few scars and dark spots. packajing clarins boring bgt ya..
hee knpa jarang pake? hahahha masa sih clarins ada serum pengecil pori mer? yeah it's a bit pricey :/ , thank you~! Beli dimana ni len??? berapa?